Lightning Powder 3-5206 Curved Tweezers, 6.75"
Home > Lightning Powder > Investigations > Evidence Gathering > 3-5206 Curved Tweezers, 6.75"
Lightning Powder's Curved Tweezers are ideal for times when you need to reach those especially hard-to-reach places or for precision tweezing. Measuring 6.75 inches in length, this tweezer has a nickel base so it can be safely sanitized with either alcohol, solvents or in an autoclave. These are great, quality product you'll be happy to use again and again. NOTE: Metal tweezers should not be used when processing with Physical Developer. In that case you should use disposable polystyrene tweezers, which are available either in single-use, hermetically sealed packages or loose. 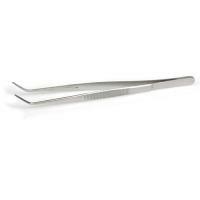 ©2002-2019 CopsPlus.com: Lightning Powder 3-5206 Curved Tweezers, 6.75"